Dreams really have one size. We make them have different sizes but no matter what, every dream is the same size- God sized. The following man and woman had a dream. But was one bigger than the other? They both dreamed of healing. One could not walk and one suffered a woman's pain. But they both had the dream of being healed. Sarah (Genesis), Hannah (1 Samuel), and Elizabeth (Luke) all dreamed of being mothers- did one have a bigger dream than the other? It doesn't matter what the dream is- it is God sized. God is the one to make it happen. All we have to do is listen and have faith. Faith that God will provide the resources and the way. Faith in the things we cannot see. All we need is faith and an open heart and mind. The dream will never be "small". It is God Sized til the end. Great reminder!! Love this. God Sized till the end-amen. Hey Laura! What a great perspective and reminder. 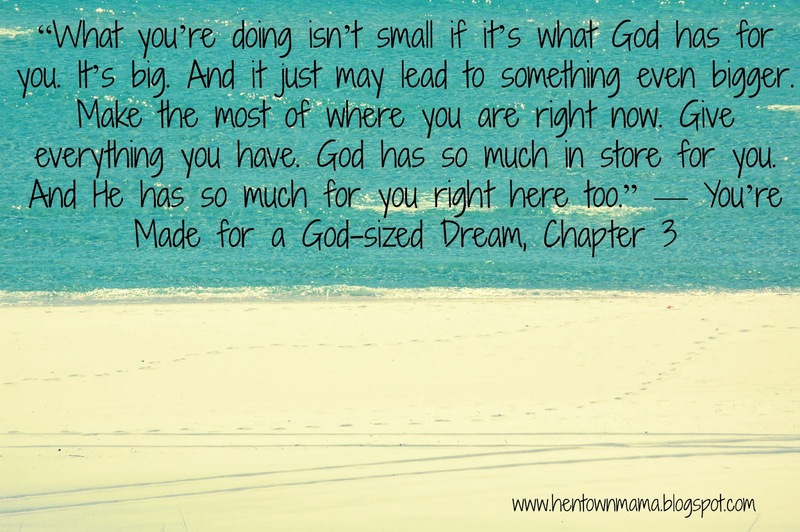 I love how you said that no matter what the size, all dreams are God-sized. A to the Men! Praying for you sister and your God-sized dream!